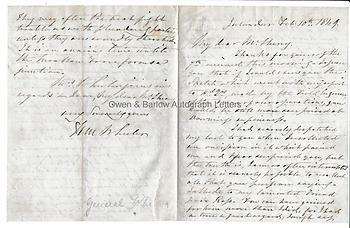 HUGH WHEELER Autograph Letter Signed. Major-General Sir Hugh Massey Wheeler. English army officer of the East India Company. Killed with his entire garrison at Cawnpore in the Indian Mutiny (1857). ALS. 4pp. Julunder. February 10th 1849. To "My dear Mr Sherry". "Thanks for yours of the 7th received this morning. I assure you that if I could show you the sketch which went with my report to H[ea]d Q[uarte]rs, made by the field engineer, of the scene of our operations, you would be still more surprised at Downing's experiences. I had scarcely dispatched my last to you when I recollected an omission in it which pained me and I fear surprised you, but the truth is, I am so often interrupted that it is scarcely possible to recollect all you propose saying. I allude to my lamented friend poor Ross. Few can have grieved for him more than I did, for I had a true and a great regard, I might say affection, for him. I considered him a soldier heart and soul, and you know that he could not have a greater recommendation in my eyes, but I liked him also as a Gentleman and a friend. Godfrey can tell you, that on hearing his name and poor Ned Christie's amongst the killed, my first exclamation was "I have lost two friends to whom I was sincerely attached and two as good soldiers as any that they have left behind them" and they filled my thoughts for days. I appointed Ross my M.B. at your recommendation, and would gladly have retained him in that office, had I not considered that Palmer, having been wounded whilst officiating, had a greater claim. Acquit me therefore, my dear friend, of indifference to his fate and of disregard to his memory. I feel that you will. Under the circumstances stated and also that you cannot relieve the Cavalry escorts, let that from hence go the whole way, but it is a pity that you do not have some carriage kept up for you, as in the weak state of all our cantonments just now, you must feel that it is an object that they should not be further weakened, for any considerable time. Indeed, nothing but this necessity would ever have induced me to ask you to weaken your garrisons, altho' I should feel quite easy as to the safety of G..G..[?] with five Companies under your command. All being quiet in my quarter, I came here on the 8th to see my Boys before they return to Leharbat [?] Simla. I propose going out to my camp at U...ger [?] about the 15th unless called away sooner, for which contingency I have left my horses on the road, but I do not expect any immediate disturbance. They may after the next fight trouble us with plundering parties unless they are soundly thrashed. It is an anxious time until the . . .[?] Force forms a junction. Mrs Wheeler joins in regards and I am, my dear Mr Sherry, very sincerely yours, H.M. Wheeler." 12mo bifolium. 13.5 x 10.5 cms (6.25 x 4.25 inches). Some mounting traces to right edge of verso. All else fine. 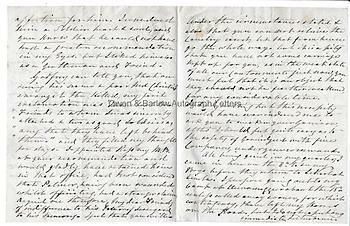 An excellent letter written by General Hugh Wheeler whilst taking part in the Second Sikh War (1848-1849). Wheeler had led the forces involved in the capture of Rangar Nangal Fort, the battles of Kalawala and the Heights of Dallah. He had been twice mentioned in dispatches and had been one of those who had received a vote of thanks from the combined Houses of Parliament. For his services, he was knighted the following year. 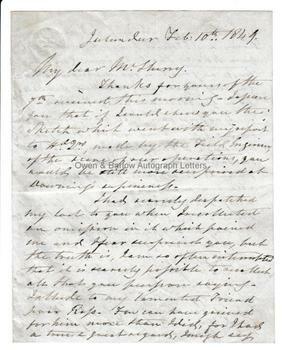 At the date of this letter, the worst of the fighting was still ongoing, following the Battle of Chillianwala in January. The decisive Battle of Gujurat took place on February 21st (11 days after this letter) when the Sikh forces surrendered. General Hugh Wheeler is today best remembered as commander of the garrison at Cawnpore during the Indian Mutiny of 1857. He held out during the siege of the garrison for some time before being offered terms of surrender by Nana Sahib. Mindful of the presence of the wives and families Wheeler, against his better judgment, accepted the surrender terms. Whilst being let to the Ganges where boats were waiting for them, the entire garrison, including General Wheeler, Lady Wheeler and the women and children were massacred by the rebels at Satichaura Ghat. Wheeler's youngest daughter was thought to have been carried off by a sowar.